This one doesn’t work…although we’re fancying it for our business cards now! You install a QR code reader app to your smartphone, which is then able to decode the data held within it to perform an action – usually, taking you directly to a specific web links, but it can be to do other things such as loading business card details directly into your phone’s contact list. 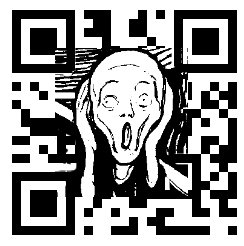 QR codes aren’t at all complicated, and you can set them up for free via any number of online services such as http://quikqr.com/ or http://goqr.me/. 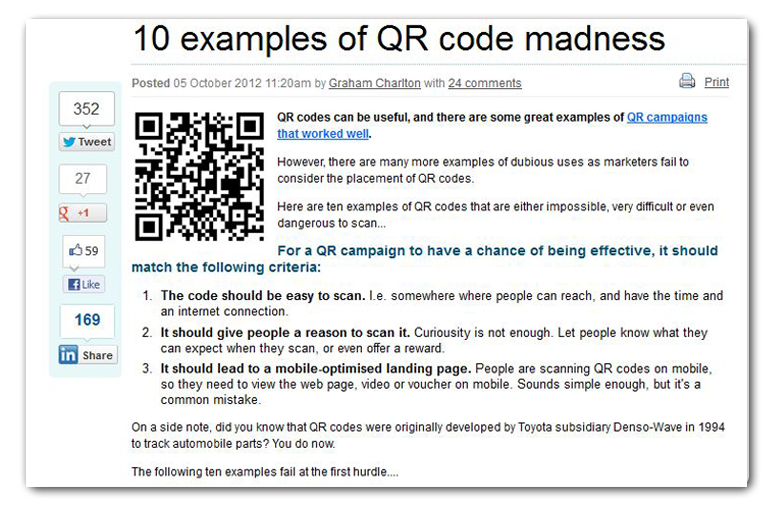 It’s quite common to see examples of marketers Missing The Point with QR codes on a massive scale. The Point being, that you’re essentially just saving the user from doing something longhand – typing in a URL, or your phone number. This is only really helpful if you’re going from an offline to an online environment – otherwise, the user could often just click a simple link to achieve the same thing. So a QR code on a paper flyer might be useful; a QR code embedded in a website, which just links to a YouTube video, is not. A QR code on a For Sale sign which, when scanned, takes the user directly to the online details for that house, is very useful; the same QR code embedded in an email, less so. You get the idea. There are times, though, when ONLY missing the point would’ve been a blessing. Here’s a collection of QR code uses so spectacularly misguided that they verge (literally, in the case of example two) on the homicidal. We love these so much that they just had to get their own blog post here – click below and enjoy!